Once the city government has stripped us of the live music that is New Orleans’ lifeblood, we will still have great food to comfort us. Everyone is okay with food, for it sings only in one’s mouth, where it cannot be heard so long as you keep your mouth closed — which is what the government wants anyway. 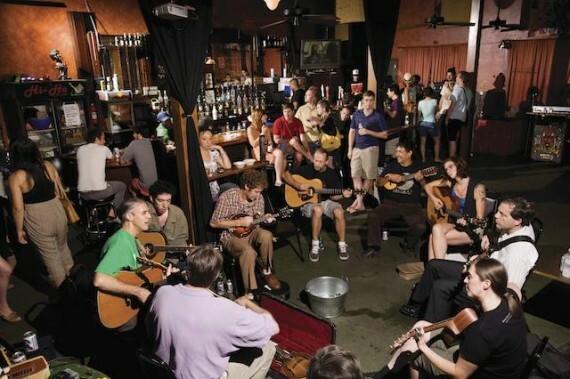 For now at least, New Orleans locals and visitors have the option to enjoy both cuisine and tunes, together, at several music clubs that also serve food. Establishments that are primarily restaurants and/or bars that feature music are not included in this review. For instance, Bacchanal wine bar didn’t make the list below, despite being one of the best jazz venues in the city. For proof that Bacchanal is really a music club that just happens to serve excellent wine and gourmet food, you shoulda come by after the cops busted in one busy weekend night as if executing a heroin bust, and shut down their music. We did, however, include Buffa’s on Esplanade. “We aim to be a destination spot where people can see live, local music,” says owner Chuck Rogers, “but then we do offer a more extensive menu than just bar food.” A $10 pan-fried redfish with salad was the special when we visited on a recent Sunday morning to hear Some Like It Hot, an old-school jazz band with a female singer/trumpet player, female pianist and female drummer. Buffa’s never charges a cover; musicians take home part of the food and drink sales, plus tips. 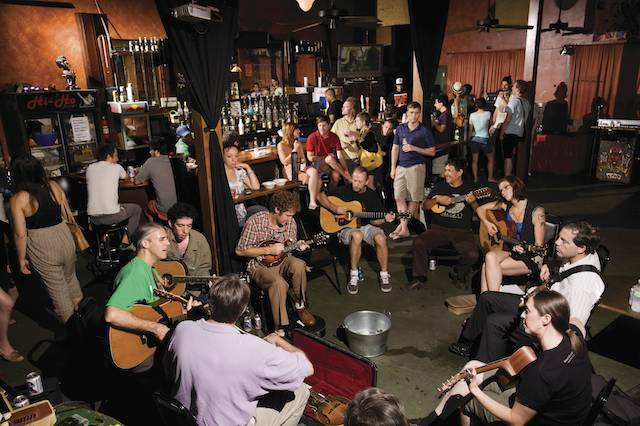 Some local music clubs boast eclectic menus that, along with fair neighborhood prices, provide great contributions to New Orleans’ culture. Siberia is the perfect example of a thriving music club with ambitious yet affordable food; rather, it was the perfect example until this August, when the authorities came by and scared Siberia into laying their soundman and door guy off and unplugging the P.A. All this despite Siberia being located on a busy street amidst several other music clubs, and despite its being the only one of those venues to face the P.A. toward the back of the room so the sound doesn’t blast out the newly soundproofed front door. Someday we may be telling our grandchildren how, long ago, we could eat and watch live music simultaneously in New Orleans. Like some odd cross between Palm Court Jazz Café and Checkpoint Charlie’s, Buffa’s is a dive bar in front, where you can smoke and bring your dog — but not your kids — while the back area around the very red stage is a kid-friendly, sit-down restaurant where Fido’s not allowed, and you can’t smoke. Seafood, fat sandwiches and Sunday morning cocktails mark the menu while jazz artists like Aurora Nealand take the stage. Funk and reggae populate the music menu at this low-key concert venue, its stage backdropped by a Bob Marley mural. Since there’s never a cover, Café Negril is also the perfect place to pop in for affordable, late- night (i.e. drunken night) Honduran chow including vegetarian tacos and gorditas, all on gluten-free corn tortillas. Carnivores are encouraged to try the pineapple, pork burritos or chicken tostadas. Gypsy Elise and the Royal Blues band are regulars on the Negril stage, and blues-rock singer Dana Abbott (as featured on the Big Easy Brides reality TV show) and her band play most every other night. This definitive, dive music club seems held together by band stickers. Checkpoint’s may not seem like much at first, but the place really has everything from blues to rock to bulk burger patties (with a side of tater tots), two pool tables, pinball, even laundry machines. One of the last places in town to still serve free red beans on Mondays, Checkpoint’s (open 24 hours) also hosts metal band Suplecs’ annually sublime and tripped-out Mardi Gras show. Though little’s ever changed at good ol’ Checkpoint’s, they now host karaoke every Monday night at 10 p.m. Don’t sing with your mouth full! This homegrown music venue — a rarity in Mid-City — features local artists, mostly rootsy and a little brassy. Anders Osborne is a staple, but the stage regularly welcomes everyone from old-timey singers like Meschiya Lake and the Pfister Sisters to avant-jazz group Cloud Sharp 9, featuring guitar geniuses Phil DeGruy and Cranston Clements, bass monster James Singleton and drummer Doug Belote. Chickie Wah Wah (named after the New Orleans R&B classic “Little Chickie Wah Wah” by Huey “Piano” Smith and the Clowns) is also one of the few places in the city where one might hear zydeco acts like Sunpie Barnes. The club’s sister business, Garage Pizza, serves from lunchtime to late night, selling not just pizzas but appetizers including feta rolls, crawfish and spinach rolls, fried green tomatoes and crab cakes. The Stooges Brass Band recently took over the lease at this venue but haven’t changed the place’s music yet. The Stooges still pack “da Ho” at their weekly Thursday gig, and the Bluegrass Pickin’ Party keeps its Monday night tradition alive. “[The Stooges] had their own idea [of] what they wanted to do food-wise,” says Christion Troxell, whose Wandering Buddha serves vegan Korean fare in the Hi-Ho’s back courtyard. “They told us we had a few months to find a new spot. But then they realized how much business we bring in here.” The Buddha may still move within the next six months, but until then music fans can enjoy dishes such as braised tofu with kimchi, spicy cucumbers and seasoned spinach. Though this chain club is criticized in some circles for repackaging New Orleans culture, the food at the House of Blues is the most delicious way in which they serve it back to us. From cornbread to jambalaya to turnip greens, the menu is as authentic as the venue’s collection of folk art, the largest in the world. The HOB’s faux-funky interior is photogenic behind acts from Grimes to Gwar to gospel bands that play every Sunday during a southern-style brunch buffet. Otherwise, fare includes American classics such as baby-back ribs doused in Jack Daniel’s barbecue sauce, served with corn bread and a mess of turnip greens. A veteran enterprise, The Howlin’ Wolf has booked an eclectic array of touring bands for years. The Wolf Den is its smaller counterpart, which not only exponentially increases the number of shows in the Warehouse District but provides top-shelf bar grub until the wee hours. Owner Howie Kaplan is also famous for managing the Rebirth Brass Band to Grammy status for the band’s 2011 album, Rebirth of New Orleans. Chow on a Cuban sandwich, various po-boys, crawfish or meat pies, tacos, or jambalaya while catching the club’s famous Brass Band Sundays, now helmed by the aptly named Hot 8. Comedy Beast every Tuesday features local, semi-polished standups, while Thursday’s Comedy Gumbeaux serves as a weekly open mic for up-and-coming jesters. Oh, the late, loud nights you’ll have at this place. One of Uptown’s few music venues, Le Bon Temps still hosts Soul Rebels Brass Band every Thursday. Along with brass and other traditional genres, Le Bon Temps steps outside the box as well, booking rock acts such as R. Scully’s Rough 7 and veteran cosmonauts Rotary Downs. The menu includes basic bar food like burgers, French fries, po-boys and quesadillas. And don’t tell anyone but… free oysters every Friday on Le Bon Temps’ much beloved, back patio. This larger-than-it-seems concert venue kicks in high gear before the sun sets. Maison features a stage in the downstairs window where you can catch early-evening jazz shows by the Courtyard Kings, then head to the big stage upstairs for comedy nights, the mighty monthly Soundclash Beat Battle, or bigger acts like rappers Juvenile or members of Brooklyn’s Wu-Tang Clan. Come take swing dancing lessons from the NOLA Jitterbugs, or sit down and order up a plate of Jamaican, ginger-beer pulled pork, or sandwiches such as steak and brie. Jimmy Buffett, the king of the Parrotheads, claimed New Orleans among his biggest inspirations back in the days before he inexplicably won a following as large and loyal as the Grateful Dead’s. Margaritaville’s menu features tropical-themed food like fried coconut-battered shrimp and jerk salmon. The front room stage exclusively hosts solo, acoustic performers, from the folk-pop of Beth Patterson to the “progressive blues” of Colin Lake. Open since the night Topsy Chapman first took the stage here in 1989, the Palm Court showcases New Orleans-style traditional jazz, with frequent performances by the city’s oldest living jazz trumpeter and vocalist, Lionel Ferbos, now 101 years old. Enjoy the company of proprietor Nina Buck, who greets and entertains her guests. The menu, served from 7 to 11 p.m. Wednesday–Sunday., features French-Creole cuisine such as Shrimp Ambrosia sautéed in a light fennel and Pernod cream sauce over pasta and the café’s famous oysters bordelaise. The story on this remarkably colorful establishment has it that after years of business, old, asbestos shingles were finally removed from the structure, uncovering classic, hand-painted advertisements from the ’40s — all in mint condition. 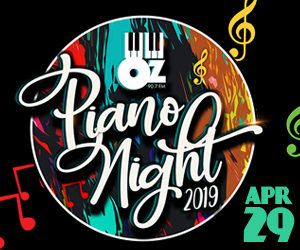 Check out obscure New Orleans rock, blues, funk and jazz bands while munching sandwiches, seafood, a creative assortment of burgers and an impressive selection of salads. Rivershack’s sports bar vibe is accentuated by a pool table, dart boards and video golf. Boiled seafood (and lots of shouting) available during Saints games. One of the most unique clubs in the world, this bowling alley and concert venue also serves food from burgers to beignets. Music fans both local and visiting for Jazz Fest know that Rock ’n’ Bowl is one of the only places in town to catch real Cajun and zydeco music on a regular basis. Line dance with zydeco kings like accordionist and singer Geno Delafose, or Nathan and the Zydeco Cha-Chas. Organist Joe Krown is a regular performer, as is young fiddle player Amanda Shaw and the Creole String Beans. Owned by Luke Allen from the Happy Talk Band, music booker Matt Russell of TireFire and former Mimi’s bartender Daphne Loney, the club they named Siberia could not feature a more apt menu. “My family’s Ukrainian, so I learned a few things from [my] grandma and great aunts,” says Matt the Hat, who cooks pierogi, kielbasa, blini, cabbage rolls and other Slavic foods until midnight, daily. Siberia has fallen victim to superfluous regulation and so lacks live music at the moment, but the bar currently charges no cover for game shows, movie nights and any other non-musical entertainment they can dream up. If you’re in town for music, you’ll end up on Frenchmen Street, and if you’re on Frenchmen for jazz, you’ll end up at Snug Harbor — if it weren’t already at the top of your itinerary. For more than 30 years, Snug Harbor has dedicated itself to well-produced, authentic jazz shows that lean toward the “modern.” Snug famously has a TV in its front bar where you can sneak-peek the show happening inside on stage while eating seafood, steaks and sandwiches. For 30-years plus, this unassuming Marigny eatery and club has featured artists as diverse as smooth jazz violinist Michael Ward and free jazz titan Pharoah Sanders. Tuesday nights’ open-mic events are famous, while Thursdays feature blues with Chucky C and Clearly Blue. The dinner menu boasts seafood, gumbo, wings and pastas. Sunday brunch features singer Danon Smith. Sweet Lorraine’s recently changed their nightly show time from 10 p.m. to 8, and stopped their Sunday evening shows entirely. Starting this month, the club will offer a late-night breakfast buffet with omelet and waffle stations every Friday and Saturday from midnight to 4 a.m.
A $3 drink is pretty rare on Frenchmen Street anymore, but that’s exactly what you’ll get at Three Muses’ margarita happy hour, which also features piano music daily from 4:30 to 6:30 p.m. The cramped seating areas are more than made up for with truly creative small plates of lamb sliders, stuffed pork tenderloin and duck pastrami pizza. Three Muses’ tiny front-window stage hosts several shows a night featuring heavy hitters like cellist Helen Gillet and pianist Tom McDermott.